One of London’s most iconic shopping spots is 100 years old this Thursday, and has called on a host of its designer friends to help with the celebrations. 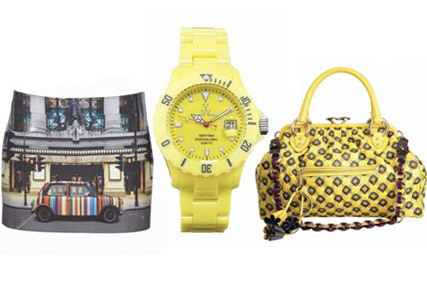 Marc Jacobs, Paul Smith, Lulu Guinness, Ralph Lauren, Jimmy Choo, Mulberry, Giles Deacon and more have all designed exclusive pieces to celebrate Selfridge‘s centenary, all in the store’s signature canary yellow. 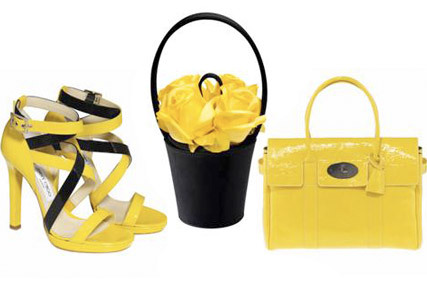 From Giles comes a patent leather dress in the iconic pantone 109 shade, Marc Jacobs has reworked one of his signature must-have bags, Jimmy Choo has added some seriously strappy heels and Mulberry has created a patent yellow edition of its much-loved Bayswater bag. Customers making purchases will receive them in one of four limited edition designer Selfridges carrier bags, created by Stella McCartney, Giles, Vivienne Westwood and Paul Smith. The carriers are set to become must-haves in their own right. But the celebrations don’t stop there. The store is set to be adorned with 1,500 yellow origami planes this week, just in time for a birthday party, while an exhibition of the legendary department store’s history will also be unveiled. As well as reflecting on the past, the shop will also be moving into the future, and will unveil its first ever transactional website. For more info, visit Selfridges.com here.